This is an interesting signs that I'd be interested in finding out about that is located on 7th Street in downtown St Paul. What I can tell you, really only based on my visual detective work, though I'm sure there is a lot more history involved with this location. The sign is a mix of a few different ownerships or partners. 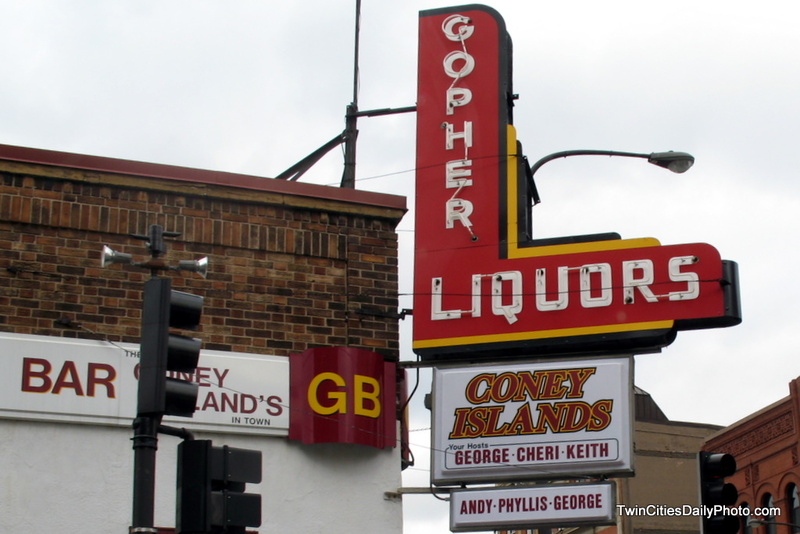 The Gopher Liqours sign looks like it was added to the Coney Islands sign with your Hosts: George-Cheri-Keith. Though there is a sign added under it reading: Andy-Phyllis-George. Are these new hosts? Is this the same George from the original grouping of names? Or are there now six different hosts [or owners]. What is the most current name of this business as there are several signs saying there could be many: Gopher Bar, Gopher Liquor, Coney Islands? Or is it several business in the same location? Too many questions right? Incidentally, a couple blocks and around the corner sits a vacated restaurant called Original Coney Island Cafe which I featured a photo of back in January 2008, are these two locations owned by the same group? Interesting place. Have been there several times for lunch when we feel brave. Ever been inside? I have never been inside, the Gopher maroon and gold colors always catch my eye. I'm usually on my way to something when I pass by these days.